One of the most popular courses for beginners is the PADI Open Water course. The Professional Association of Diving Instructors – PADI – has set global standards for diving certifications for over 25 years and following this method of teaching you should be a certified diver within few days. · The Discover Scuba Diving programme lets you try diving and observe the underwater world under the safe supervision of an instructor, without having to commit to a full-length course. If you enjoy nature and adventure this is the perfect way to get an introduction to an exciting new world. · We conduct this programme on a regular basis at a time convenient for you. Again we have multi lingual instructors available to give you the basic knowledge in your native tongue. Typically, we conduct the first dive over a two hour session in the morning with a thorough explanation about being under water and a 30 to 45 min dive (depending on you air consumption). For your first under water venture you will go into the pool or pool-like body of water to get accustomed to the new surroundings and learn how to use scuba equipment. · You are now eligible to join the divers on the boat, so come and discover the Red Sea with us: With the "Discover the Red Sea" programme we offer you the opportunity to go out on the boat to some of the enchanting local dive sites, just as divers do. You will be accompanied by one of our instructors who will take you for a close-up view of some of the most spectacular underwater world. Having completed both the first and second dive off the Discover Scuba Diving experience you may again receive a credit towards the first open water dive of the PADI Open Water Diver course. All courses are based around the Standard Open Water Diver course and include 2/4 pool or confined water sessions, 4 dives in open water and to a varying extent 4 academic presentations. Academic training is held in our well equipped, cool classrooms with initial water training in the warm, clear waters of the Red Sea surrounded by tropical fish and coral by shore. The first days of the course are held around the dive centre, the open water training dives are conducted by boat - first two - and - last two. Both days are spent at new and enchanting dive sites to enjoy the abundance of marine life and to complete your training. You will apply your new knowledge and skills on the four qualifying dives under the guidance of your instructor. At the start of the course all candidates will be tested on their ability to swim a distance of 200m and to tread water for ten minutes. The PADI Open Water Diver Manual is essential reading for all courses. The Standard Open Water Diver course is the basic Open Water Diver course. It typically involves academic theory mixed with water sessions. During the academic sessions you will watch the Open Water Diver video and listen to your instructor's elaboration. After each theory session you will go for a pool session dive in the shallow water in front of the dive centre, where you will practice some skills and then go and explore the aquatic life. On day two or you will conduct your first open water dives, usually conducted from boat, to a depth of 12m. This is where you apply what you learnt in the classroom and in confined water to adapt to the underwater environment. The last day sees you out on the boat for your last two dives, this time to a depth of 18m. is for people that do not want to spend the whole three or four days away from their family - schedule: Three or four mornings or afternoons. Or for people who only have two or three days time - schedule: Two and a half full days. Or for people who do not want to go "deep", but want to potter around in the shallows - schedule: in conjunction with the Standard course. It is a shorter version of the Standard course and involves the first three academic and confined water sessions from the Standard course and the first two open water training dives from the boat. You will receive a certification stating Scuba Diver, which enables you to go diving to a depth of 12 metres under the direct supervision of a diving professional. To upgrade to Open Water Diver status, all you need to do is complete the last academic, confined and open water training session within 12 months. The Advanced course, as it is called for short, focuses on expanding your diving skills and increasing your diving experiences in Deep and Navigation diving as well as three other exciting dives of your choice. This short course is an easy way to gain experience with little time commitment and can be easily completed on a week-end or even whilst on a dive trip, either daily diving or live-aboard. Of course there are more dives to chose from and we can offer most of them. These courses are designed for students who have completed the PADI Open Water Diver Course or any other entry level diving course. The Advanced Open Water Diver Programme consists of two courses: The Advanced Course and the Advanced Plus Course. Both courses are performance based and give you the chance to learn more about an underwater activity that interests you most or you might need during one of your dive trips. There are some home study assignments and/or some extended briefings, but no classroom sessions. As with the speciality courses, these two courses are conducted either out by shore or on the boat. This gives you a chance to dive with your friends and to see the fantastic dive sites as well as continuing your dive education. Each advanced programme dive gives a grounding in a special area of interest and may count towards a PADI Speciality Diver course. Each course dive can be conducted as a consecutive course. Especially the Advanced programmes as well as the specialities can be conducted as single dives over a longer period of time. Pricing can be arranged as the dives progress: Dive per dive. ( Equivalent meaning entry level certification with at least four Open Water Dives). · Or - for certain specialities - PADI Advanced Open Water Diver or equivalent (Equivalent meaning having a certification beyond entry level with at least 20 logged dives showing experience in Deep and Navigation). · Minimum age 12 years. The minimum age varies from speciality to speciality. These courses are designed to further your knowledge of skills in specific diving activities. Like the Advanced programme, specialty courses have hands on practice with some theory sessions. During these courses you will get in-depth information about an underwater activity that you might need during one of your dive trips or that interests you most. · Deep Diver - two days / 4 dives. · Underwater Naturalist - one day / 2 dives. · Drift Diver - one day / 2 dives. · Boat Diver - one day / 2 dives. · Multilevel Diver - one day / 2 dives. · Equipment Specialist - one day / 0 dives (This course will give you information on basic maintenance of your equipment and introduces you to other models. · Peak Performance Buoyancy - one day / 2 dives. · Night Diver - two nights / 3 dives. increased safety / extended bottom times. The course covers the history, decompression sickness, oxygen management, all applications of EANitrox and oxygen handling. A certified "nitrox" diver is allowed to plan and dive on all mixes of EANitrox to its maximum benefit, the mixes of 32% and 36% being the most commonly used. The course scheduling is typically so that the first day involves covering all the academic sessions and the second day you are out on the boat, putting what you have just learnt into practice, whilst enjoying the environment. 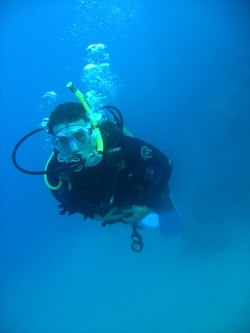 · Be certified as a PADI Advanced Open Water Diver or equivalent. (Equivalent meaning proof of certification beyond entry level with the experience in deep diving and navigation), or as a PADI Open Water Diver, or equivalent (equivalent meaning holding an entry level certification from another agency) with proof of at least 10 logged dives. · Minimum age 15 years. This course is designed to expand your expertise on diver safety. It is the first time in your diver training when start to focus your attention on how to assist others and teach you how to prevent and handle diving accidents. During this four day course we will provide you with detailed academic presentations and in-depth training of Rescue Diving Techniques. During the training sessions you will practise the newly learnt skills. Towards the end of the course you have the opportunity to apply your new skills by conducting rescues together with your course buddies during possible emergency scenarios. The Emergency First Response and Eqipment Specialist courses are both held in conjunction with the Rescue Diver course. They are invaluable courses giving you a better understanding on first aid and basic equipment mantenance respectively. They are not essential to the Rescue Diver course, but make it complete, whilst making you a well trained and skilled rescuer. Although this course is demanding it is designed to be enjoyable. Self Rescue & Diver Stress, Diving First Aid, Emergency Management and Equipment Considerations. Swimming & Non-Swimming Assists, Panicked Diver Responses, Underwater Problems, Missing Diver Procedures, Surfacing the Unconscious Diver, In-Water Artificial Respiration, Equipment Removal during Artificial Respiration, Egress and First Aid for Diving Accidents. All Rescue Diver students at Scubablu-Divers have the opportunity to visit the local Recompression Chambers, thus also getting an insight in the treatment of diving emergencies. You will learn basic CPR and First Aid procedures which you will be able to apply to any incident. The course incorporates mainly practical sessions with scenarios to reinforce the learnt techniques. The course is based on current medical guidelines within the US and UK and is subject to changes as new medical standards are released. A retraining every two years is of importance to keep up-to-date with any changes. The PADI Emergency First Response (EFR) course meets the requirements for the PADI Rescue Diver, Advanced Plus, Dive Master, Assistant Instructor and Instructor courses. The Dive Master rating is the first step on the professional career path. This course is designed to expand your diving knowledge and diving skills to a professional level. It will enable you to lead certified divers and assist with any training activities conducted by a PADI instructor. The course starts off with an orientation to the course and an overview of the scheduling. During this time you will get to know your way around the dive centre. You will complete some of the theory assignments, like The Role & Characteristics of a PADI DM, Supervising General Diving Activities and Assisting with Student Divers in Training. This will enable you to actively take part during the courses conducted by your instructor, as part of your practical assignments. Over the next two weeks you will be busy assisting on various PADI courses, although the Open Water Diver and Advanced courses are more common. You will receive hands on training by experienced instructors. During this time the rest of the academic topics, including the five theory topics (Physics, Physiology, Decompression Theory & Dive Tables, Equipment and Skills & Environment) will be covered - the same theory sessions you will be evaluated on during the Instructor Exam - , giving you 12 presentations in total, eight of which have an exam. Academic presentations work on the principle of a mixture of self study and instructor presentations. Usually the instructors hold their presentation and then the candidates do their home study assignments before taking the exam. It is advisable to get the Divemaster Manual, Encyclopaedia and Knowledge Review Workbook before you start the course. This allows you to study at home at your own pace and leisure, getting the basic grounding and giving you time during the actual course to deepen this knowledge. Working through the Divemaster Manual and completing the Knowledge Reviews is part of the course. The new Encyclopaedia - CD-ROM version is brilliant for home study. It includes all that is in the Encyclopaedia itself as well as in the Workbook, but also includes film inserts (e.g. a short film on how scuba tanks are made) and more graphic displays for better understanding. It includes a History of Diving, gives a background and an overview of all the famous pioneers. There are water-man-ship requirements - such as 400m swim, 800m snorkel, 15 min tread, 100m tired diver tow, diver rescue assessment, stress management assessment and underwater map making - to fulfil. The instructor will work with you to develop your personal diving skills to instructor level quality. Once the basic training is over you will assist the instructor with diving activities, to expand your knowledge on being a dive guide. You will be involved with all aspects of being a dive guide, from writing crew lists via check-in/out procedures, tank filling to guiding small groups. At first you will be the main dive guide’s shadow to learn the trade. You will then swap roles and, under the supervision of the instructor / dive guide, assume the role of the dive master of the boat. Finally you have the chance to be the second guide on the boat and be able to lead a group of divers independently. Welcome CPR from another training agency and proof of first aid training).